Bertie trying to help with my book..
Pets? That's an easy one. Finally, after wanting one for twenty years or so, last year I brought Bertie the tortoise home, as my best friends' change in circumstances meant she could no longer look after her menagerie of animals. 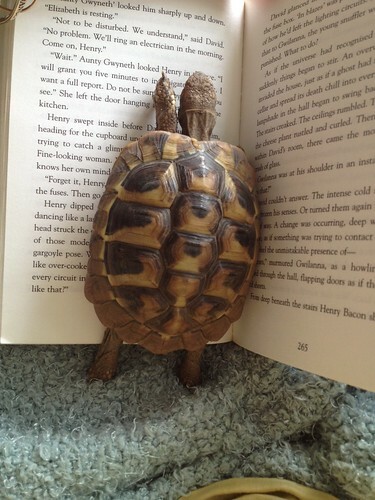 He's a Hermann's tortoise, named by my other best friend as we aren't entirely sure whether "he"'s a she or a he. He mostly eats salad leaves at the moment, with dandelions and tomatoes as a treat now and then. I am turning over a small section of the allotment to grow some "tortoise mix" seeds, which incorporate quite a few different plants which are safe for them to eat. Ha Tortoise Table. I don't know why that's made me laugh so much but it has. 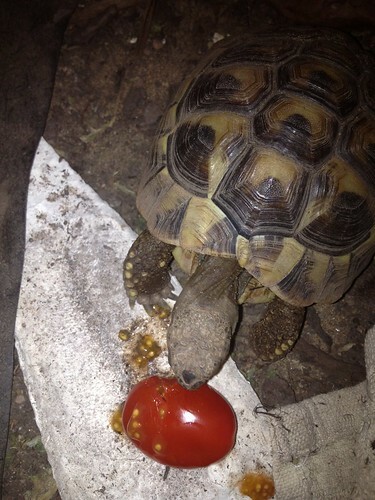 I've looked after a hibernating tortoise in a fridge for a friend once. The fridge has be opened to allow air to circulate and they were away over Christmas so once a day I'd pop over and open the fridge door for a bit. Easiest pet-sitting I've ever done. OMG! Your so lucky. Bertie is so cute. Not sure I've ever found Tortoises as cute in real life as they are often portayed. Love Bertie helping with the book though, he/she looks so inquisitive.